Prior to CrossFit San Leandro, Joanie’s background consisted of Olympic Weightlifting, running, triathlons, softball, dirt bikes, snowboarding, and soccer. She was introduced to Olympic weightlifting by Donny Shankle who coached her for several years. She immediately fell in love with the sport of Olympic weightlifting and has competed in numerous local meets on CFSL’s weightlifting team. Olympic weightlifting led her to CrossFit in 2011, which reignited that team sport mentality and desire to push herself to new limits. She is a mother of two children and knows what it takes to get back in shape. After having her first child, she suffered constant low back pain for years. Through weightlifting and her training at CrossFit San Leandro, she has been able to maintain a healthy, strong, and pain free back. 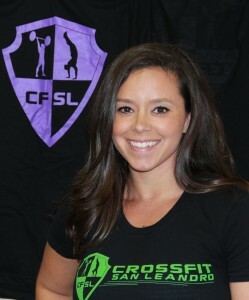 She is passionate about helping the members of CFSL reach their goals and live the healthy life they dream of. Joanie wears many hats at CrossFit San Leandro. She is the gym/office manager, coach, director of social media, and the list goes on. If you have photos or videos for Facebook or Instagram, email her at: joanie@crossfitsl.net.